Welcome to yet another post on Christmas Cards. Today I have a fun technique to share with you to bring in subtle shine to the cards and give a wonderful texture to it at the same time. No Glitter, no texture paste, no shimmer sprays here, but the trick is to use some Organza ribbon with shimmery colors and variety in a width that can cover the entire card. I am not sure where you get Organza strips that are about the size of a 4x6 card here, but I had got some from my brother on his travel to UK. The cards as such are very simple. 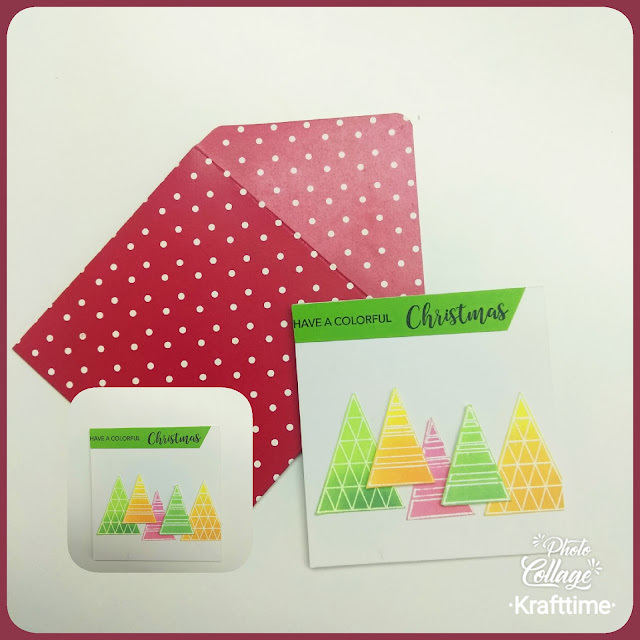 I stamped the tree from Craftyscrappers onto different card panels and blended some bright colors using both Distress as well as pigment inks. Then I placed the organza piece on top and taped the edges neatly behind the card panel. Then I added it onto a top folding 4x6 card on matching shaded and stamped the insides with a simple Christmas sentiment from the same set. 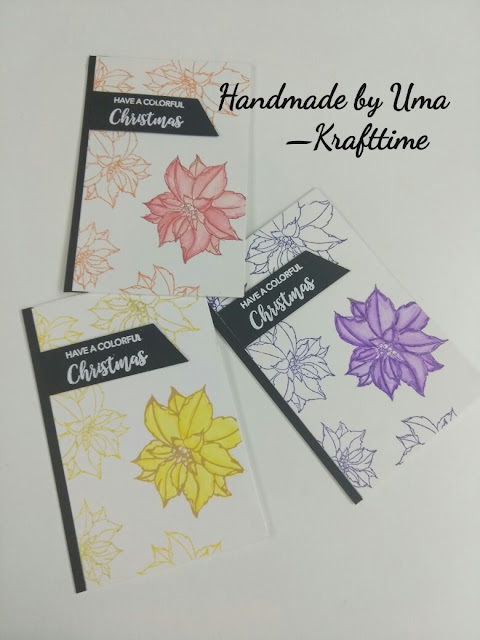 Christmas Cards Day 2 - Color me trees from SSS! Hey, fellas, It is day 2 of my Christmas Cheer card making this year and I plan to do as many as possible and share it with you guys until Christmas. Today I have a card which is not the usual dimensions of an A2, but I went for a smaller squarish card. 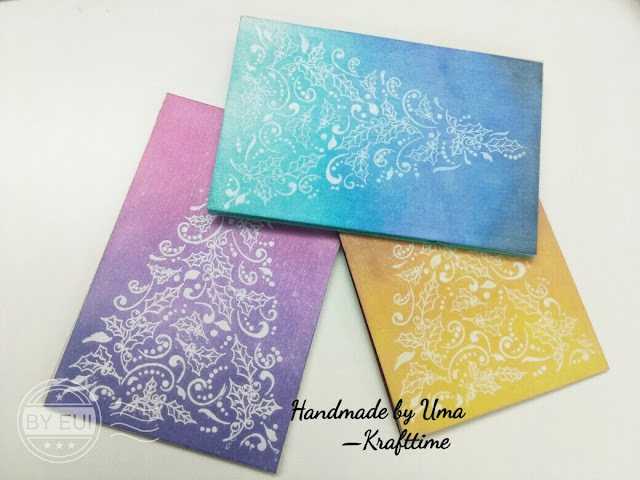 I stamped the tree images using some embossing ink and heat set it with White embossing powder. Then I blended in some cheerful colors on to the trees and fuzzy cut them. I was not very careful about the fuzzy cutting and kept in playful! For the sentiment, I used the sentiment from the same SS COlor me Trees stamp set and added it as a banner on the top of the card. Since the card is a simple and nondistracting one with mild color pop, I wanted to envelop to be bright and screen Christmas! What better than a Red polka dot envelope! I used the WRM Envelope punch board to create the envelope. Hope you liked the card fellas!!! Linking it to the following challenges. I recently saw the video posted by amazing Jennifer on her channel describing the spotlight stamping technique and gave it a try. Although my take is not as elaborate as hers and uses a single outline stamp with minimal colors, I loved the effect and the fact that it was really so easy to do after hearing her explain! A bit early for Christmas, but hey, better late than never! Hope you are doing good. I am slowing getting back to crafting for some time everyday and taking time out to calm my nerves by crafting a bit. 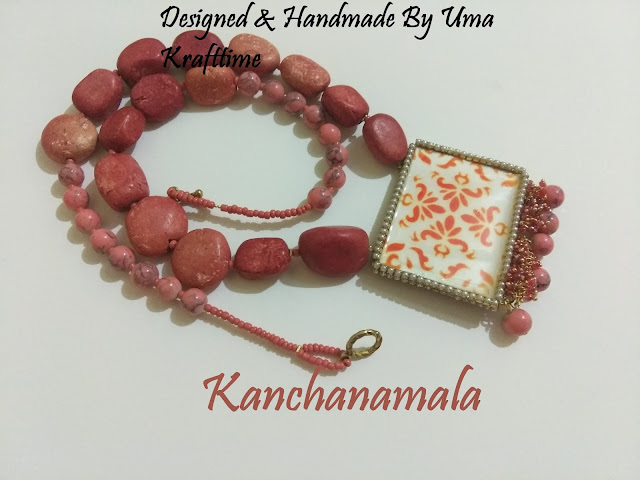 The festival seasons are upon us at India and this is the right time to start making some jewellery!!!! I got out all of my bead boxes and wanted to try something different. I had these stancils out on my desk left from some paper crafts and scrapbooking and I felt why not use those designs to get some pendants done.. So here are a couple of examples on how you can use stencils and create really beautiful jewellery out of it. The first one is a damask kind of pattern that is stencilled and converted to a pendant and linked to some very earthy tone stone beads. The next one is one of my favourites. It has a simple small repeating pattern that I stencilled in and added some lovely violety beads along with shell pearls. Do let me know what you feel about this guy's and leave me your comments on the same. I promised I would come back with a set of Teachers' day cards for you. 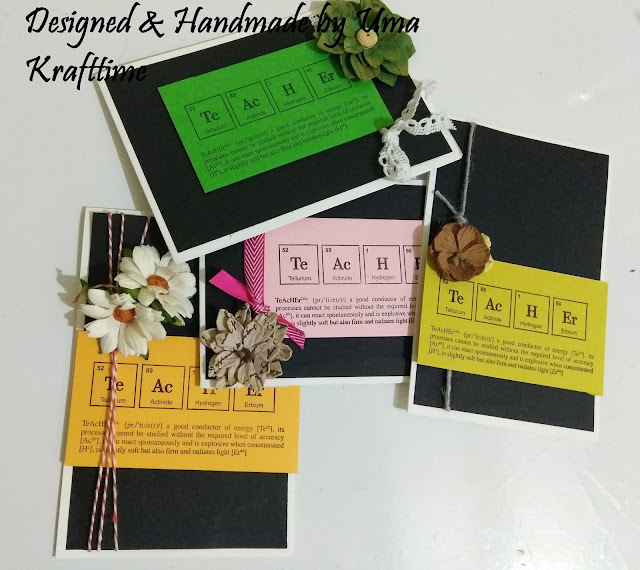 The supplies are from different Manufacturers, but mostly from two dear Indian manufacturers Craftyscrappers and Mudra. Konica and Varshita and two wonderful souls and I wish them all success at their entrepreneur life. Let me know what you think of this fellas! The card concept: withered florals. I have incorporated flowers with distressed and withered feel to it. Linking this to the Path of Positivity Challenge #51: Teachers deserve a lot of love and this is an attempt to surround them with art and love!!! Hope you are having a great day! It is Teacher's day today and I wish all the teachers out there a very happy teachers' day. I still wish I can go back to school or college and life the simple life with only studies to worry about! Sigh! Gone are those days!! Coming back here!, today I ought to be sharing some cards for my teachers (which I will post soon) but I am sharing a decoupage upcycle project that I recently did. One of the most satisfying things for me is to craft and give away the result to friend or colleague. Just to see the happiness and feel work appreciated is an awesome feeling. My two best friends are entering the world of motherhood and this gave me an opportunity to make something special for them. 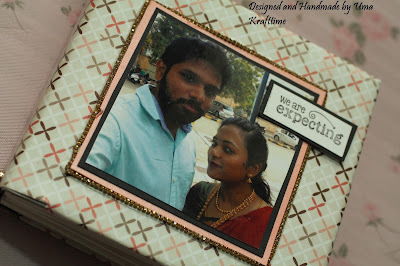 Here is what I made for one of my friends Vyshali. This one is a tab bit more special as I had the help of her husband who is a really good friend of mine by getting the pictures selected and printing them out and sending them over so that I could use them right away. Here are the pics for you! The stamps are mostly from Craftyscrappers, they have an amazing collection in the Pregnancy and Baby theme. The others are from Jane's doodles, Peekaboo, and some various other manufacturers.